The nose is arguably the most prominent aspect of the face. Reconstruction of the nose involves alterations and aesthetic details that cannot be easily hidden with clothing or apparel. The extreme 3-dimensionality of the nose allows slight structural modifications to have great ramifications. Thus, the reconstruction of a defect in the nose is all the more difficult because of the great many nuances the nose possesses. An depicting the aesthetic subunits of the nose can be seen below. 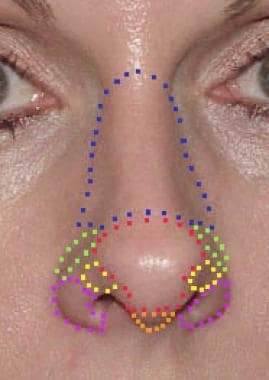 Aesthetic subunits of the nose: Nasal dorsum (blue), alar crease (green), nasal tip (red), soft triangle (yellow), columella (orange), and nasal ala (purple). The reconstruction of the nose goes back thousands of years. The ancient Hindus are credited with the first nasal reconstruction attempts. In ancient India, punishment involved having one's nose cut off, and such a defect was reportedly first repaired by transposing a cheek flap. The Italians also used reconstructive techniques for the nose during the Renaissance. The Branca family and Tagliacozzi experimented with flaps and rhinoplasty techniques. However, the British documented the Indian techniques of reconstruction they saw during their time in the subcontinent. Gillies, of England, formulated rules and techniques for nasal reconstruction. These efforts were passed on, expanded, and refined to form the multitude of reconstructive options available today. Before determining how to properly perform nasal reconstruction, the aesthetic and anatomical breakdown of the nose must be understood. Anatomically, the nose is made up of a vascular lining, alar tip cartilages (sculptured cartilage), bone braces that buttress the dorsum and sidewalls of the nose, and thin skin that matches the rest of the face. Thus, when a deformity is present, the actual tissue missing must be delineated, whether it be the cover (skin), lining (mucosal lining, septal mucosa), or framework (septal hard tissue, alar cartilages, upper lateral cartilages, nasal bones, alar fibrofatty tissue). Also, the anatomical location of the defect and the surface extent of the defect must be examined. For further reading, please see the Medscape Reference article Nasal Anatomy. Initially, attention to the wound or wounds created by trauma or neoplasm excision is necessary. Determining the location, breadth, and depth of the wound or wounds is critical. Some small wounds may not require surgical intervention (eg, small defects of the medial canthus that may heal successfully by secondary intention), while other larger wounds may require extensive planning with a multistaged approach. The quality of surrounding skin and any indication of compromised vascular supply, such as scarring due to prior surgery or radiation therapy, should be considered. Identification of adjacent tissue with similar texture, color, and sebaceous gland density improves the aesthetic outcome. These factors often dictate the type of flap or graft needed for reconstruction. Functional deficiencies such as airway patency should be identified and addressed prior to graft or flap placement. Prior existing asymmetry, functional deficiencies, and the possibility of skin mismatch are a few of the issues that need to be discussed with the patient prior to surgery. The general indication for nasal reconstruction is a defect or loss of function of the nose that results from trauma or surgical excision of neoplasm. The preferred method for tumor removal is Mohs micrographic surgery. This technique is best suited for the removal of malignancies such as basal cell carcinoma and squamous cell carcinoma that may have poorly defined margins or may be recurrent or aggressive in nature. Biopsy samples of all tumors should be collected beforehand for confirmation. Mohs micrographic surgery then allows for careful review of peripheral and deep margins using horizontal frozen sections of the specimen, allowing for accurate identification and excision of clinically inapparent tumor. An initial operation may be necessary to release old scars, to re-establish patency or function, or to allow repositioning of normal tissues. However, the indications for each reconstructive procedure vary based on the site, size, and depth of the defect. Aesthetic subunits of the nose (see the image below) should be considered for all procedures. Violation of these borders may result in less-than-satisfactory aesthetic results. This is especially true of defects of the alar crease, where defects smaller than 1 cm may include the nasal ala, the alar crease, and the supraalar crease nasal dorsum. In fact, completing the resection of an aesthetic subunit and performing a total reconstruction to the border of adjacent subunits that allows for less noticeable scarring may be desirable. When secondary intention healing results in unacceptable wound contraction and poor aesthetic results, reconstruction must be considered. Generally, secondary healing produces acceptable results when the wound is smaller than 1 cm in diameter, less than 4-5 mm in depth, and farther than 5-6 mm from the mobile alar margin. Specifically, the medial canthal portion of the nasal root and the alar groove heal well by secondary intention. Considering the thickness of the skin is important in planning skin grafting. The thickness of the nasal tip averages 2400 μm, compared with a thickness of 1300 μm in the nasal dorsum. Therefore, submental, nasolabial, or preauricular donor sites are usually better fits for nasal tip cutaneous defects. Thinner postauricular grafts are ideal for superior nasal dorsal defects, although they may be appropriate in the nasal tip of some thin-skinned patients. The nose is composed of 3 layers: the skin, the bony and cartilaginous framework, and the mucosal lining. The shape of the upper two thirds of the nose is created by the nasal bones, dorsal septum, and upper lateral cartilages. The tip of the nose is defined primarily by the lower lateral cartilages. The nose is broken down into natural concave and convex surfaces that become apparent as lighted ridges and shadowed valleys, defining underlying areas of cartilage and bone. A thorough understanding of these subunits is fundamental for creating a proper reconstructive plan for a nasal deformity. As described by Burget, 5 of these subunits are convex: the tip, dorsum, columella, and paired ala-nostril sills. The paired sidewalls and the soft triangles make up the 4 concave subunits. When more than half of a subunit is involved, replacing the entire subunit to yield a better aesthetic result may be more practical. Because a subunit flap takes on a concave (rather than a convex) form when it heals, subunits are also best used to repair the convex (but not the concave) unit areas. However, when flaps are not used, symmetry among all subunits should be considered because the natural shadows created by nasal contours determine the desired cosmetic result. Zone 1 covers the upper dorsum and sidewalls of the nose and is the most superior. Its skin is thin, smooth, and without sebaceous glands and rests easily over the underlying cartilage and bone. Zone 2 begins approximately 1.5 cm above the supratip area of the skin and covers most of the nasal tip and alar lobules. It continues inferiorly halfway down the infratip lobule and to within 4 mm of the alar margin. The skin here is thick and has sebaceous glands. Underlying the skin is a layer of dense fat. Zone 3 includes a small strip along the alar margin, the soft triangles, the lower half of the infratip lobule, and the columella. The skin is smooth, thin, and without sebaceous glands. In contrast to the skin of zone 1, the skin is relatively fixed to the deep cartilage and does not move easily. The nasal anatomy clearly increases in complexity from the nasal root to the nasal tip. The superior nasal dorsum is composed of paired nasal bones with overlying skin that is thin, usually mobile, and readily reconstructed. Glabellar skin is a good source of extra skin when intrinsic nasal skin is inadequate for repair and skin grafting techniques are not desired. The middle nasal vault consists of skin whose thickness is similar to that of the upper nose that overlies the paired upper lateral cartilages. Finally, the lower third of the nose consists of thick sebaceous skin relatively fixed to the underlying lower lateral cartilages. This makes reconstruction of lower third defects significantly more challenging than reconstruction of the remainder of the nasal framework. The 3-dimensional structure of the lower third of the nose also adds to the complexity of these reconstructions. Subunits of this area include the nasal tip, the paired nasal ala, the columella, and the paired soft tissue triangles. Precision in identification of and adherence to these separate units is critical in maintaining the natural shapes of the lower nose. The nose has a rich blood supply that allows for a multitude of local flap options. However, proper knowledge of the vascular anatomy is required not only for flap design (pedicled or random) but to prevent compromised blood supply, especially in the setting of trauma. The arterial supply to the nose can be divided into those supplying external and internal structures or those based on the origin of the supplying branches (internal or external carotid arteries). The nasal septum is vascularly supplied by the sphenopalatine artery from the maxillary artery, anterior ethmoid artery from the ophthalmic artery, ascending branch of the greater palatine artery from the maxillary artery, and septal branches of the superior labial artery from the facial artery. Little’s area is the convergence of all these arterial supplies at the anterior portion of the septum. The lateral nasal wall is supplied by branches of the greater palatine artery, sphenopalatine artery, and the anterior and posterior ethmoid arteries. The external nose is supplied by the branches of the facial artery (lateral, septal, and angular arteries), ethmoid artery (external nasal artery), and ophthalmic artery (dorsal artery). Veins in the nose follow their arterial counterparts. Of note, the venous system lacks valves and directly communicates to the cavernous sinus. This creates a potential risk of intracranial infection through hematogenous spread. Generally, if a patient can tolerate the initial tumor excision, the patient can also tolerate the reconstructive procedure. Absolute contraindications include poor general health (a failure to obtain preoperative clearance) and residual disease or uncertain surgical margins. If possible, relative contraindications should be addressed prior to surgery. Burget GC, Menick FJ. Nasal reconstruction: seeking a fourth dimension. Plast Reconstr Surg. 1986 Aug. 78(2):145-57. [Medline]. Cerci FB. Usefulness of the subunit principle in nasal reconstruction. An Bras Dermatol. 2017. 92 (5 Suppl 1):159-62. [Medline]. [Full Text]. Kelly-Sell M, Hollmig ST, Cook J. The superiorly based bilobed flap for nasal reconstruction. J Am Acad Dermatol. 2018 Feb. 78 (2):370-6. [Medline]. Hsiao YC, Huang JJ, Zelken JA, et al. The Folded Ulnar Forearm Flap for Nasal Reconstruction. Plast Reconstr Surg. 2016 Feb. 137 (2):630-5. [Medline]. Menick FJ. Nasal reconstruction with a forehead flap. Clin Plast Surg. 2009 Jul. 36(3):443-59. [Medline]. Chen C, Patel R, Chi J. Comprehensive Algorithm for Nasal Ala Reconstruction: Utility of the Auricular Composite Graft. Surg J (N Y). 2018 Apr. 4 (2):e55-e61. [Medline]. [Full Text]. This image shows a 1.5-cm defect that involves the left medial canthus and nasal dorsum. Medially based rotation flap repair of the defect in Image 2. Postoperative frontal view of patient in Image 2. Postoperative lateral view of patient in Image 2. A large defect that involves the medial canthus, right infraorbit, right nasal dorsum, and right cheek. The infraorbital and medial canthal aspects of the defect were repaired with a full-thickness postauricular skin graft. The aesthetic unit borders were re-created using an advancement cheek flap and advancement nasal flap. Postoperative view of the patient in Image 6. Color match between the skin graft and the surrounding skin is satisfactory. This is aided by confining the graft to defined aesthetic units. Later postoperative view of the patient in Image 6 shows a medial canthal web that formed from late skin graft contraction. This was repaired with a Z-plasty. A defect of the nasal dorsum, separate from the lower nose subunits. These defects are best repaired with local advancement of rotation flap techniques. A rotation flap repair of the defect in Image 9. The flap is designed within the involved subunit of the nasal dorsum. Postoperative frontal view of the patient in Image 9. Upper dorsal defect that occupies a single aesthetic subunit. Advancement flap reconstruction is used to correct an upper dorsal defect that occupies a single aesthetic subunit. Early (3-mo) postoperative result of the patient in Image 12 that demonstrates normal symmetry and shape to the nose. Hyperemia of a dorsal scar is not unusual but gradually fades over 6-12 months. A 1.3-cm defect of the left nasal tip down to exposed left lower lateral cartilage. This defect was allowed to granulate for 3 weeks followed by full-thickness postauricular skin graft. This 3-month postoperative view of the patient in Image 15 shows good color and contour match. Alternatively, a bilobed flap could be used for reconstruction. Lateral view of the patient from Image 15. Cutaneous defect at the junction of the nasal tip and left nasal alar subunits. This defect was repaired following several weeks of secondary intention healing. A postauricular full-thickness skin graft was used. If the patient's lower nasal skin were thicker or more sebaceous, a submental graft would be preferred. This early postoperative view of the patient in Image 18 shows a demarcation between the graft and the surrounding nasal skin. This postoperative frontal view of the patient in Image 18 shows the maintenance of the 3-dimensional nasal integrity. An early photograph of the patient in Image 18 following secondary dermabrasion of the skin graft. The contour blends in well with surrounding nasal structure. The temporary erythema may easily be camouflaged. An older man is shown with an extensive cutaneous defect that involves the nasal tip, left nasal ala, nasal supratip, and nasal dorsum. Because of the patient's age, a conservative full-thickness skin graft was used after allowing some initial granulation tissue formation at the base of the wound. Oblique postoperative view of the patient in Image 22. Full-thickness skin grafting provides an expeditious technique for healing large cutaneous defects of the lower nose. Alternatively, a staged paramedian forehead flap could be used. A defect of the right nasal tip that measures 8 mm by 23 mm. This patient has thick sebaceous skin. In this patient, a full-thickness skin graft would likely provide inadequate color and depth match. A laterally based advancement flap of the nasal subunit was used. The patient from Image 24 with a laterally based advancement flap in place. This postoperative frontal view of the patient from Image 24 demonstrates maintenance of the 3-dimensional nasal integrity. A postoperative lateral view of the patient in Image 24. A small defect of the left nasal tip. This patient has thick sebaceous skin, making grafting techniques a less desirable option. This image shows a rotation flap repair in place. Despite the small dimensions of the flap in relation to the size of the tip aesthetic unit, wide undermining is required to avoid distortion of the 3-dimensional framework. A postoperative frontal view of the patient in Image 28 following flap and interval dermabrasion. A right nasal tip defect down to the level of the lower lateral cartilage. This patient clearly has thick sebaceous lower nasal skin. Grafting techniques would not provide a satisfactory depth or color match. This defect is repaired with a subcutaneous pedicled island flap based subcutaneously. This is a useful reconstructive option for lateral tip defects in which a skin graft is not considered a good option. This postoperative photograph of the patient in Image 31 shows good healing and maintenance of the 3-dimensional integrity of the nasal framework. This patient had a superiorly based nasolabial flap performed elsewhere to reconstruct a defect of the alar crease. The resulting pincushioning of the flap disturbs the intrinsic nasal symmetry and distorts the nasal framework. The flap shown in Image 34 was excised and replaced with a full-thickness postauricular skin graft. Postoperatively, the curves of the alar crease were restored. A large left nasal crease defect. Important features of this defect are that it involves the superior fold, the crease, and the nasal ala. It extends only several millimeters into the nasal ala and, therefore, should not affect the integrity of the rim itself. Note the smaller medial defect, which is repaired independently. The patient from Image 36 is shown following repair of alar crease defect using full-thickness postauricular skin graft. This graft blends well in skin color and preserves the natural folds and symmetry of the alar crease. The smaller medial defect was closed using a rotation banner flap. A left alar crease defect that does not encroach enough on the alar rim to cause concern about rim integrity. Postoperative appearance of the patient in Image 38 following full thickness skin grafting of defect. Notice the maintenance of the normal curvatures of the alar crease. This patient had 2 nasal defects. The first involved the left nasal tip and alar rim. The second defect involved the superior nasal tip. The superior defect was repaired immediately using a rotation flap. The inferior defect was allowed some second intention healing and was then repaired using a contralateral preauricular chondrocutaneous graft from the anterior helical rim. The patient from Image 40 is shown following chondrocutaneous grafting to the left nasal tip and alar rim. The contralateral anterior superior rim provides a good color match and a good match for the contour of the rim. Lateral view of the patient in Image 40 that demonstrates restoration of a natural curvature of the nasal ala following grafting. Large defect involving a through-and-through excision of the left alar rim and the cutaneous involvement of the nasal tip. A lateral view of the patient in Image 43. Early postoperative view of the patient in Image 43 that shows the restoration of a normal alar contour following chondrocutaneous grafting from the contralateral anterior helical rim. A lateral view of the patient in Images 43 and 44 shows restoration of the normal curvature of the alar rim following grafting. A patient with a defect that involves the right nasal tip skin. The underlying lower lateral cartilage and vestibular lining is intact. The patient from Image 47 is shown 2 weeks following excision of the remainder of the nasal tip subunit skin and replacement with right paramedian forehead flap. The donor site was closed primarily. An early postoperative picture of the patient in Image 47 following division of the forehead flap and repair of the glabellar donor site base. Late postoperative frontal view of the patient in Image 47 that demonstrates good color match and incorporation of flap into surrounding nasal skin. A lateral view of the patient in Image 50. Nasal defect that involves the right nasal tip, right lower nasal dorsum, right lower lateral and upper lateral cartilages, right nasal ala, and right nasal crease. A secondary defect of the right nasofacial groove is present. The left paramedian forehead flap is in place. Note that the nasal tip subunit was not removed. Only 25% of the tip subunit was involved in the defect. Vestibular lining was supplied by a contralateral superiorly based septal mucoperichondrial flap. Septal cartilage was used to replace the missing lower and upper lateral cartilages. The donor site was closed primarily. Postoperative view of the patient in Image 52 that demonstrates good color match and incorporation of forehead flap into surrounding nasal skin. The 3-dimensional nasal framework was restored as described in Image 53. A postoperative lateral view of the patient in Image 52. Notice the lack of tip projection, which could have been prevented with a tip graft during the initial flap procedure. An oblique view of the patient in Image 52. A patient with large nasal defect that involves the nasal tip, right ala, right alar crease, right nasal dorsum, and right cheek. A defect of the right vestibular lining is also present, as well as right lower and upper lateral cartilage. A lateral view of patient in Image 58. A base view of the patient in Image 58. The replacement of the right lower lateral cartilage with autologous septal cartilage graft. A right advancement cheek flap is also in place. The left paramedian forehead flap and the right cheek flap are in place. The donor site is left to close by secondary intention. A postoperative frontal view of the patient in Image 58. Note the donor site healing, which is satisfactory considering the extent of the initial defect. A postoperative lateral view of the patient in Image 58. This patient presented with an extensive fungating tumor that involved the right hemiface. Extensive defect following extirpation of an extensive fungating tumor (see Image 65). The defect involves the entire right nasal skeleton, nasal septum, right pyriform aperture, right maxilla, right upper lip, and right cheek. The maxillary dentition is visualized. The defect described in Images 65 and 66 was repaired as follows: A superiorly based right mucoperichondrial flap was taken from the remnant septum. Auricular cartilage grafting was used to repair the nasal skeleton. The left paramedian forehead flap was used for skin covering. A right cheek flap was developed to repair the cheek defect. A right laterally based lip flap was created and was advanced medially. The mucosal intraoral defects were repaired with grafting beneath the lip flap. The 3-month postoperative view of the patient in Images 65 and 66. The patient was treated with postoperative radiation therapy. Subsequently, he was brought back to the operatory, where the right nares were re-created. Lateral view of the patient in Images 65 and 66. Note the persistent extensive right maxillary defect and premaxillary defect secondary to the extent of the tumor. Despite these shortcomings, the flaps healed well and functioned satisfactorily. The left image shows a paramedian forehead flap. The back side of the forehead flap is lined with either a split-thickness skin graft or AlloDerm (freeze-dried acellular dermis) to decrease oozing of fluid from the raw surface of the posterior side of the flap. The right image shows the flap pedicle separated. The left photograph shows a full-thickness midline supratip defect. The right photograph shows the postoperative view following a V-Y advancement flap repair. The left photograph shows a midline zone-1 lesion over the nasion. The right shows a rotation glabellar forehead flap repair. The left photograph shows lesions on the right cheek, alar, and left supratip. The right photograph shows the postoperative view following repair with a paramedian forehead flap and cheek advancement flap. A midline lesion of the nose over the tip, supratip, and dorsal subunits. Postoperative results following repair with paramedian forehead flaps. In order to improve the cosmetic outcome, the defect was enlarged to include the entire tip and dorsal subunits. This allowed the final scar to rest within the natural junction of subunits, making them less perceptible. The infratip and right tip-defining point defects are shown on the left. The contracted defect was re-created to allow precise anatomic reconstruction. This included the columella, soft triangle, and right hemidome (nasal tip). The defect was enlarged to include the entire subunits of the dome, columella, and soft triangles. A paramedian forehead flap following the course of the supratrochlear artery (distal end of flap is de-fatted down to subdermal plexus) is shown in the center. On the right, the 6-week follow-up photograph is shown. Debulking at 3-6 months will be performed to improve cosmesis. Alar reconstruction with a nasolabial flap and an auricular cartilage graft with bilobed mucosal advancement flap for internal lining is shown on the left. The postoperative follow-up photograph is shown on the right. Debulking at 3-6 months will be performed to improve cosmesis. The left photograph shows a defect along the lateral sidewall and nasofacial groove. It is repaired with a cheek advancement flap along the nasofacial groove (shown in the center). The postoperative follow-up is shown on the right. The left photograph shows an alar crease and lateral sidewall repair with nasolabial flap and V-Y advancement flap from the sidewall, respectively. The early postoperative follow-up photograph is shown on the right. The left photograph shows a defect along the alar crease and lateral sidewall. The right shows the repair using a bilobed flap.